Modern application architectures based on microservices have made appliance-based load balancing solutions obsolete. Multi-cloud application services can help enterprises deploy container-based applications in Kubernetes and OpenShift clusters into production quickly. Applications based on microservices architecture require a modern, distributed application services platform to deliver a service mesh. Traditional appliance-based ADC solutions are no longer an option for web-scale, cloud-native applications deployed using container technology such as microservices. Kubernetes and OpenShift container clusters can have tens and hundreds of pods, each containing hundreds and thousands of containers, mandating full automation and policy driven deployments. Avi provides a centrally orchestrated, elastic proxy services fabric with dynamic load balancing, service discovery, security, and analytics for container-based applications running in Kubernetes and Red Hat OpenShift environments. Enterprises adopting Kubernetes and OpenShift need a cloud-native approach for traffic management and application networking services. 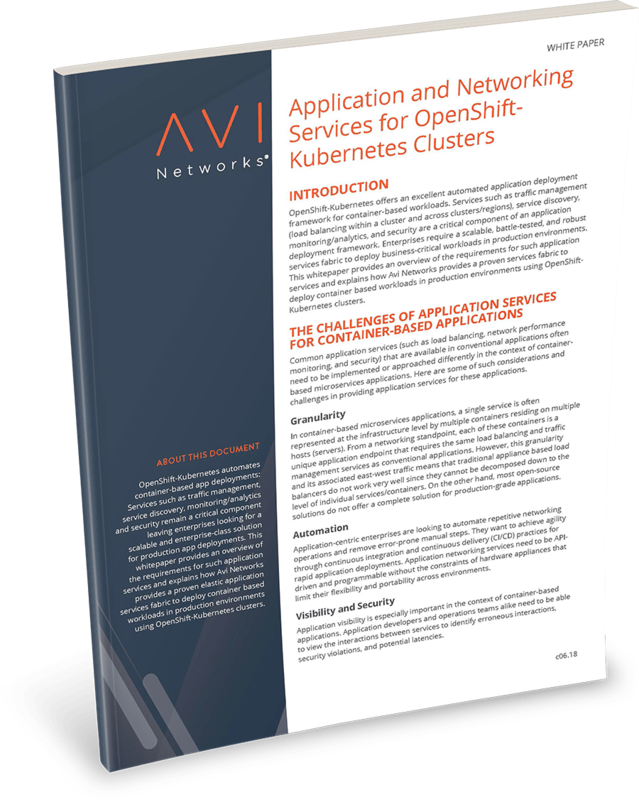 Avi delivers a scalable, enterprise-class, and Universal Service Mesh to deploy and manage container-based applications in production environments using Kubernetes and OpenShift clusters. Avi Controller: A central control, management and analytics plane that communicates with the Kubernetes and OpenShift master, deploys and manages data plane proxies (Avi Service Engines), configures services and aggregates telemetry analytics from Avi Service Engines. Avi Service Engines: A service proxy deployed on every Kubernetes and OpenShift node providing the application services in the dataplane and reporting real-time telemetry analytics to the Avi Controller. Avi extends L4-L7 services with automation, elasticity/autoscaling and continuous delivery onto Kubernetes & OpenShift Platform-as-a-Service (PaaS). Also, Avi provides unprecedented visibility into Kubernetes/OpenShift applications showing service dependencies using application maps. Enterprise-class load balancing for mission-critical application deployments in Kubernetes and OpenShift clusters. Avi Controller aggregates this information from Avi Service Engines, making it available via dashboards and REST APIs for quick utilization by network administrators. Services such as traffic management, service discovery, container monitoring, analytics and security remain a critical component for enterprises to deploy containers in production. Avi provides a proven service mesh to deploy container-based applications workloads in production environments using Kubernetes-OpenShift clusters. Learn about how Avi's elastic service mesh integrates with OpenShift Kubernetes clusters. It's been our vision - distribute application network services all the way to the edge, as close to the applications possible.